Google has acquired Clever Sense, the developer of Alfred, a personalized restaurant and bars recommendations app, for an undisclosed price, the companies said Tuesday. The Internet giant has been strengthening its local offerings. In September, it bought restaurant ratings publisher Zagat to boost its online maps and local business listings with trustworthy reviews and recommendations. The Alfred mobile app offers personalized recommendations for nearby restaurants and bars. Google has bought Alfred’s developer, Clever Sense. 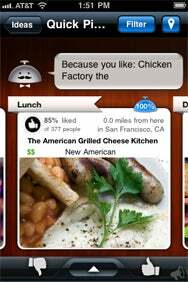 Alfred, which currently provides recommendations on local restaurants, bars, and night life could broaden its scope down the line, potentially making it the Android alternative to the Siri personal assistant on Apple’s iPhone 4S. Clever Sense’s co-founder and CEO Babak Pahlavan suggested in a notice on the company’s website that Alfred may include other information sources and services. Discovering local information is extremely important to both users and businesses, and the acquisition of Clever Sense will benefit both, Pahlavan said. “With Google and Clever Sense working together, our entire team looks forward to building more intelligent, serendipitous and magical services,” he added. However, Google senior vice president of mobile Andy Rubin told the AllThingsD AsiaD conference in October that he didn’t believe the phone should be an assistant. “You shouldn’t be communicating with the phone; you should be communicating with somebody on the other side of the phone,” he said. Alfred is available on both Android and the iPhone and iPad from Apple. Groupon was planning to acquire Clever Sense at one point, according to unconfirmed reports. An extraction engine built into the Clever Sense Platform curates large amounts of unstructured crawled data by using natural language processing, statistical machine learning, and data mining algorithms, the company said on its website. A “Serendipity Engine” learns about the user's interests and preferences based on his interactions with various sources, including Clever Sense apps, Facebook, and Twitter. Google did not immediately respond to a request for comment. Marissa Mayer, Google’s vice president of local, maps and location services welcomed the Clever Sense team in a Twitter message.